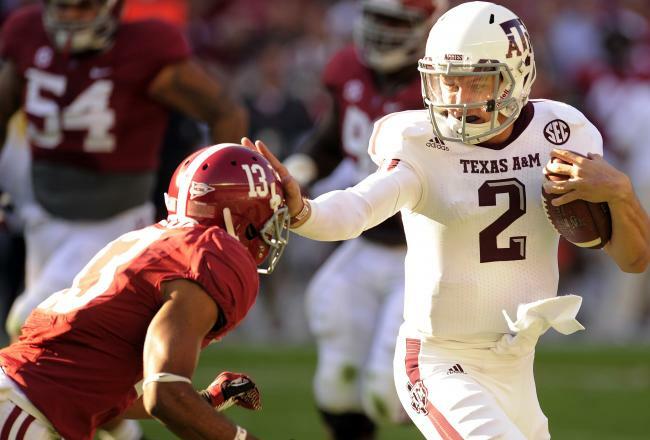 Johnny Manziel - How Will Johnny Football Handle Celebrity in 2013? When the Texas A&M freshman quarterback's name was called as the 2012 winner of the Heisman Trophy, I felt a thrill of delight. 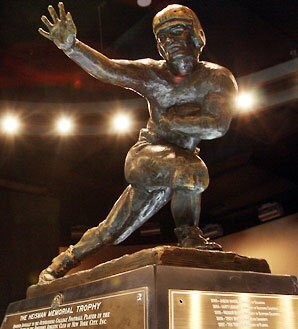 I'm a Texan (I wasn't born here but I got here as soon as I could), and for the second year in a row, the prestigious Heisman Trophy went to a Texan. Not to a University of Texas player (my favorite college football team), but to players from Baylor (Robert Griffin III) and now Texas A&M. Ricky Williams was the last U.T. player to get the Heisman (1998), and Earl Campbell before him (1977). From Johnny Manziel to Johnny Football to Johnny Heisman, the young man has exploded from high school football overachiever to college football legend in less than a year. On the field, he did things no other football player has ever done. When Tim Tebow won the Heisman in 2007, he had 3,286 yards passing and 895 yards rushing, truly awesome numbers. By comparison, Johnny Manziel had 3.419 yards passing and 1,181 yards rushing. Along the way, he put the Texas A&M football team on his back and knocked off then No. 1 Alabama, 29-24. So he deserves the honor. But put yourself in his shoes. How would you handle all this notoriety if you were 20 years old and analysts on ESPN were calling you "Johnny Football"? During all the preceremony interviews and on stage the night of the award, he conducted himself with grace, humility and maturity. On-screen, ESPN's Chris Fowler asked him, "Are you sure you're a freshman?" But when asked about his son's maturity, Manziel's father said this in an interview: "He's not there yet." Not so long ago, back in June, months before the 2012 football season started, Manziel was far, far from being a legend. According to news reports, he got into a fight and was arrested and jailed for disorderly conduct and presenting a fake ID. Has the season really matured him? Is his character strength for real? How will he handle the pressure to be "Johnny Football" again next year? What will happen when opposing teams study the tapes and adjust their defenses to stop him? Will he be as hungry next year as he was this year, or will he let the celebrity go to his head? In other words, how will Johnny Football handle celebrity? Since the Heisman, part of the answer is that he really enjoyed it. He appeared on all the late night talk shows, and he seemed to enjoy it and handle the exposure with grace. The other part of the answer is what he did a month later in the Cotton Bowl. Few Heisman Trophy winners have ever had to deal with as much adulation and as many distractions as he had during his break from football. He put on a demonstration of football wizardry rarely seen as he inspired Texas A&M to a 41-13 route of an excellent Oklahoma U. football team. And oh by the way, passed for 287 yards (22 of 34 completions) while racking up 229 rushing yards (only 17 carries). That many rushing yards is rare for a running back, unprecedented for a quarterback - 516 total yards. He zipped around defenders so quickly that they couldn't seem to lay a hand on him. The bottom line, on the big stage he proved that his Heisman celebrity was no fluke, and he didn't let it go to his head. The ultimate answer is illuminated in one of my favorite novels, The Teachings of Don Juan, by Carlos Castaneda. In the book, the character Carlos is being instructed by Don Juan, a shaman teacher. Don Juan talks about the "four natural enemies" of a "man of knowledge," or "warrior." He says that the first two enemies are fear and then clarity. A warrior defeats them by denying them. Only then can he move past them to achieve power, which itself becomes the third enemy. To prevail, a warrior must not indulge in the power, but "deny" it, meaning to continue moving forward without identifying with it. Celebrity is a form of power. Many people who achieve celebrity and the power that comes with it let it go to their head. Elvis, Michael Jackson, Britney Spears...these come to mind immediately. All fell from grace because they failed to deny their power. Manziel seems so humble. I hope it's not just his handlers, because I know he's getting great public relations coaching. I hope it's real. I hope he enjoys the moment, finds a place for his hardware and puts this amazing experience behind him. Next year there won't be any Texas A&M freshman gag rule. The media will be shining a spotlight and creating their hype stories all year long. That's what they do. Now that he's achieved goals beyond his dreams, will Johnny Manziel be able to get hungry again? Will he be able to focus on leading and throwing and running again? Will he stay humble and do the work to get better? Will he deny the power?